By now the lesson is clear: Burning coal and petroleum produces carbon dioxide, the heat-trapping gas that contributes to the warming of our globe. That alone is enough reason to believe fossil fuels are not a sustainable basis for society long-term. But here’s another reason: It took millions, even billions, of years for these fuels to accumulate, and we’re running through them at a startlingly fast pace. 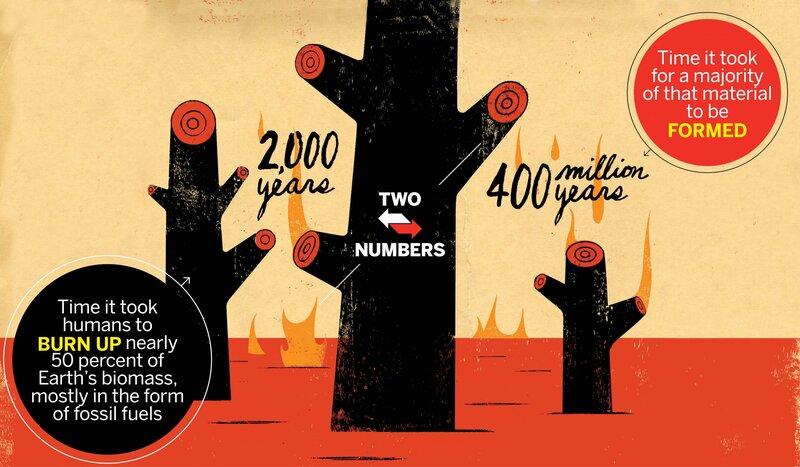 A study published in July in the Proceedings of the National Academy of Sciences calculates that we've burned nearly half of Earth’s biomass in the past 2,000 years, with 10 percent of that being consumed in the past century alone. Study author John Schramski, a researcher at the University of Georgia, likens Earth to a battery. Plants, mostly those in forests, have gradually harvested the sun’s solar energy over eons, converting it into chemical energy in the form of fossil fuels, reserved in the Earth forever—until we got to it. When we burn that stuff in factories and automobiles, much of the energy that Earth had been storing returns to space in the form of heat. Energy cannot be created or destroyed. But biomass can. And now, “Earth’s biomass battery is running out,” Schramski says. To see how fast it’s happening is astonishing, says William Schlesinger, an emeritus biogeochemist at the Cary Institute of Ecosystem Studies who wasn’t involved with the paper. “It certain made me sit up and think about rising human numbers and resource use,” he adds. Earth’s biomass is the key factor distinguishing it from all the inhospitable planets in our solar system, which contain none that we know of. By burning so much of it, we are becoming more similar to one of these lifeless worlds, Schlesinger says. It’s hard to say exactly how long it took to produce all Earth’s biomass, since it comes from many different plants, as well as algae and other sources. One 2003 study written by biological scientist Jeff Dukes (now at Purdue University) suggests that it would take approximately 400 years for all of Earth’s life forms to produce the amount of energy used by humans in a single year. Of course, people have burned biomass throughout history, and fire has shaped humans and civilization in indelible ways. It's probably not feasible to ever cut down our fossil fuel usage to zero. A natural question, then: How much biomass can we burn and still be sustainable? Schramski says he doesn’t know the answer—though given the rate at which combustion exceeds biological productivity, it’s probably “a lot less”—but he hopes his new study gets people thinking about the problem.